There is a good supply of airports in Mongolia, which helps overcome some of the challenges of traveling by land. Domestic flights, like international flights, are generally pretty expensive these days, but can save you a lot of time. A return flight out West (to Olgii, for example) would save you five full days of overland travel from Ulan Bator. 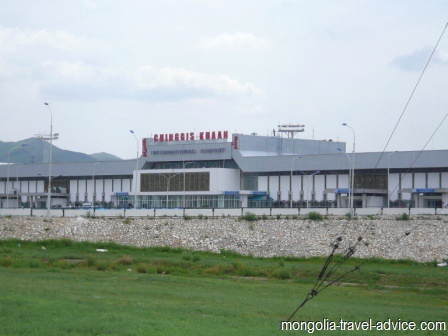 Domestic flights to airports in Mongolia all leave from Chinggis Khan International airport and head to the larger aimag (i.e. province) capital cities. Below I've listed those airports with commercial flights, as well as more remote airstrips where well-heeled travelers could plan a charter flight. Aero Mongolia and EZnis are the two Mongolian domestic airlines. 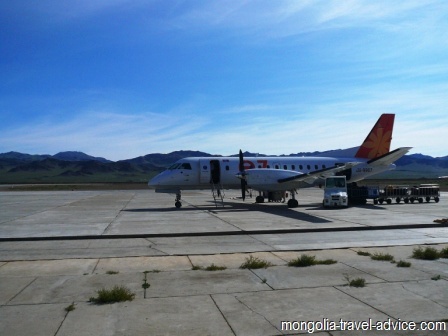 Head to my page on domestic flights in Mongolia for information on costs, schedules and bookings. Moron: (Northern Mongolia; Khovsgol aimag). Closest commercial airport to Lake Khovsgol. Flights out to Olgii stop here, so it's possible to plan a Khovsgol/Altai Mountian trip by plane. EZnis and Aero Mongolia fly here. Dalanzadgad: (Southern Mongolia; Omnogovi aimag). Closest commercial airport to the most interesting parts of the Gobi Desert, including GurvanSaikhan National Park. Serviced by EZnis and Aero Mongolia. Olgii:(Western Mongolia; Bayan-Olgii aimag). Closest to Altai Tavan Bogd National Park in the Altai Mountains. Borders Kazakhstan; destination for the Golden Eagle Festival. Flights to Kazakhstan leave from Olgii, making it an international airport. Aero Mongolia and EZnis. UlaanGom: (North-western Mongolia; Uvs aimag). Remote aimag with stunning, mountainous lakes nearby. Aero Mongolia and EZnis. Khovd: (South-western Mongolia; Khovd aimag). Altai Mountains, some remote national parks nearby. AM and EZnis. Choibalsan: (Eastern Mongolia). Industrial city; major airport in eastern Mongolia. Near eastern grasslands, and remoter half of Khentii Mountains (Ulan Bator is closer to the western part). AM and EZnis fly here; EZnis connects here before flying further east to Hailar, in Chinese Inner Mongolia. Bayankhongor: (Central Mongolia; Bayankhongor aimag). Nearest to great national parks and steppes of central Mongolia. EZnis fly here. Altai (Western Mongolia; Gov-Altai aimag). Bordering the Gobi-Altai mountain range. Ulaistai (Donoi Airport): (between central and western Mongolia; Zavkhan aimag). Near Otgon Tenger Uul Strictly Protected Area; highest moutains in central Mongolia. Aero Mongolia and EZnis. Note that the airport is over 20km from Uliastai! Khatgal (Northern Mongolia; Khovsgol aimag). Khatgal is right on the southern shores of Lake Khovsgol. Flying here would save the 3 -hour trip north from Moron, but will probably cost you more than a flight/car via Moron. Ondorkhaan (Eastern Mongolia; Khentii province). Closest airstrip to the Khentii mountains. Ondorkhaan is a medium-sized city by Mongolian standards. Dadal (Eastern Mongolia; Khentii province). Small town on the Russian border. Remote airstrip to take you right into the Onon-Balj national park. Often used by expeditions trying to find the burial place of Genghis Khan. Tsetserleg (Central Mongolia; Arkhangai Province). Town right in the middle of the national parks of central Mongolia. The road to Tsetserleg is 80% sealed, so you'd only fly here if you were in a real hurry. Bulgan (Northern Mongolia; Bulgan aimag). Mine workers might fly into here if visiting nearby Erdenet. Bulgan (Western Mongolia; Khovd Province). Same name as above; different place. Bulgan in Khovd aimag is a small and remote town in the altai mountains, more connected to Kazakhstan than Mongolia. Karakorum: (Central Mongolia; Ovorkangi aimag). Ancient capital of Karakorum, including Erdene Zuu Buddhist monastery; access to central mongolian steppe and national park.EZnis fly here at times. Added to these more common airports in Mongolia; almost every Mongolian town has a little airstrip suitable for small, propeller-driven aircraft. Many of these are near coal and copper mines. If you have the money, you'll be able to charter a flight to just about any town you can see on the map (in summer, at least). For other travelers, it's comforting to know these airstrips are there in case of medical emergency.